MEXICO CITY (Reuters) - Mexico's incoming government on Friday postponed a decision on whether to complete a new Mexico City airport, saying the public should be consulted on the fate of the $13 billion-dollar hub, which the next president had initially opposed. 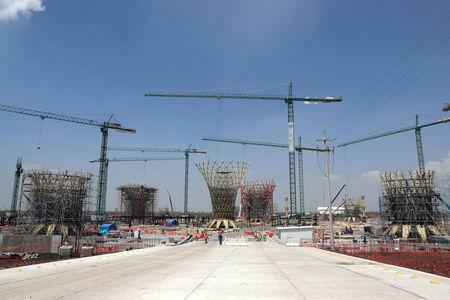 However, a significant amount of work has been completed on the ambitious project, making a decision to scrap the airport potentially costly for Lopez Obrador, who has pledged to crack down on public waste and look after Mexico's finances. The present airport, located in the east of the city, has become increasingly saturated by rising air traffic and has no room to expand. Work began on the new airport, which is a few miles northeast of the current one, in 2015. On Friday, Lopez Obrador and future transport minister Javier Jimenez Espriu held a news conference to set out their plans for the hub. At the end, questions still remained. Jimenez said a national consultation would be held in the final week of October on two options: finishing the project now under way, or adding two new runways to the military base at Santa Lucia and maintaining the current airport. "The result will be binding, and on the basis of this, the definitive decision will be made," Jimenez said, without specifying exactly how the public would be consulted. Moreover, he said the consultation would go ahead in spite of studies from U.S.-based engineering research group MITRE showing the current airport would not be able to operate simultaneously with a commercial airport in Santa Lucia because the flight paths would overlap. Other engineers consulted by Lopez Obrador's team have said it is possible to run both at once, Jimenez said, adding that the incoming administration will tap an outside agency to conduct further studies over a five-month period. If those studies backed MITRE's findings, Jimenez said the Santa Lucia plan would be dropped. Meanwhile, the cost of cancelling the new airport would be some 100 billion pesos ($5.3 billion), he added. Lopez Obrador himself said the option of turning the partially completed hub into a private concession was still open so as to reduce risk to taxpayers. The airport's future has become a litmus test of the president-elect's economic pragmatism and relations with business leaders, who have strongly backed the existing project, the biggest public works plan under way in Mexico. The planned terminal for the new airport was designed by British architect Norman Foster and the son-in-law of Mexican tycoon Carlos Slim, whose family is also co-building and co-financing the hub.